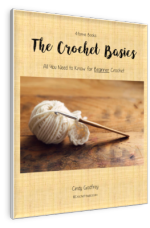 This is where you learn how to crochet a circle. Circles are made by crocheting in rounds. That means that instead of working in rows, you'll be working in circles. Each circle that's completed is called a round. Many patterns refer to this as working in the round or crocheting in the round. All that means is that you'll be crocheting in a circle. All the stitches and techniques are the same as when you crochet in rows. In rounds, though, some of the those techniques will be used in a little bit different way. Lots of projects and patterns are crocheted this way. So, this is a skill you'll want to become familiar with. There's nothing to worry about, though. 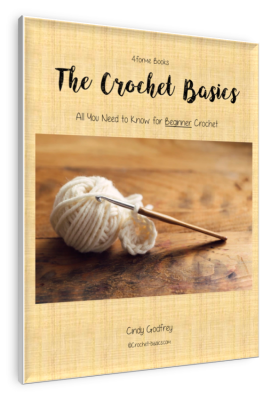 You already have everything down that you need to know to crochet a circle. So, let's get started. Round swatches make great coasters or small doilies! We’ll crochet a swatch to give you some practice. 1 – Chain 1. This is basically your turning chain, except in rounds you won’t be turning your work. The length of this chain will vary depending on the stitches that you’re working just like a turning chain. 2 – Work 12 sc (singe crochet) into the ring. yo and draw through the center. Yo again and draw through both loops on the hook. That’s one single crochet on your ring. Continue making a total of 12 sc in the ring. Work over the top of your yarn tail. This will help secure it while you’re working. Push the stitches around the ring so that they’re all bunched up together. This will make room for all the stitches to fit on the ring. How To Crochet a Circle help . . .
Be sure that you work into the middle of the ring and not into any of your chain stitches. There should be a clean circle in the middle. Even if the circle is completely closed, there should be a definite, neat center to it. When you’ve finished the round (12 sc) join the last stitch to the top of the first stitch using a slip stitch. Be sure to work your slip stitch under both loops of the chain or you could end up with a hole where you’ve joined your circle. In patterns, the instruction for this will be something similar to this: Join with ss to first sc. You’ve completed one round in your swatch. And that’s how to crochet a circle. That's all there is to it! You will use different stitches and techniques but that is the basics of it. As you continue to crochet rounds, stitches will be added to increase the circle in size so that it will lay flat. If we didn’t add stitches, we’d basically be crocheting a cylinder. In some patterns, you’ll be doing just that, but not here. We want a nice, flat circle. Let’s do a few more rounds for practice and to finish our swatch. 1 – chain 2. This will count as your first hdc (half double crochet). Remember this is like the turning chain. It builds us up to the height of the stitches you’ll be crocheting in the round. Remember the chain counts as your first stitch. 2 – Work one hdc into the first sc of the previous round. 3 – Work 2 hdc into the next sc. Both hdc will be worked in the same stitch. This will increase our stitches like I talked about earlier. 5 - Join with ss to first hdc. Chain 1. This is your first sc. Join with ss to first sc. Chain 3. This is your first dc (double crochet). dc in first sc from the previous round. Join with ss to first dc. Skip one sc from previous round and sc in next. Repeat 24 times around for a total of 25 chain loops. Join with ss to first sc from the previous round. You've completed your first swatch circle in crochet! Some patterns will not have you join each round. Instead, you'll start the new round in the first stitch of the previous round. This is called crocheting a continuous round. It isn’t any harder, it actually takes less steps. You’ll just need to keep track of the beginning of each round with a stitch marker. If a pattern uses this method, it will tell you to mark your round. Now you’re getting the hang of how to crochet a circle. You've already done 6 rounds. You’re doing great! Want some more practice? 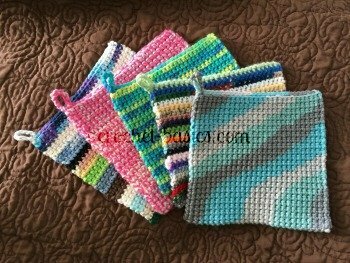 Here's a Crochet Coaster Walk-Through to help.